Provides synergistic ingredients known for their ability to neutralise diet-induced excess acid. Contains liquorice root, magnesium, potassium and calcium. Modern diets tend to create excess acid and upset the body's acid-base balance, the latter being essential for good health. Other factors such as stress, lack of physical exercise or oxygenation, add to the problem and such imbalances can lead to numerous health problems, osteoporosis being one of the most notable. - chamomile extract has a spasmolytic effect, largely due to its apigenin content. Its ability to maintain the body's acid-base balance has been demonstrated in studies conducted by Japanese researchers. - papain, an enzyme extracted from papaya, promotes digestion of proteins, thus helping to regulate the body's acid-base balance. Inexpensive pH papers are available from pharmacies which will provide your body's pH via a urine test. 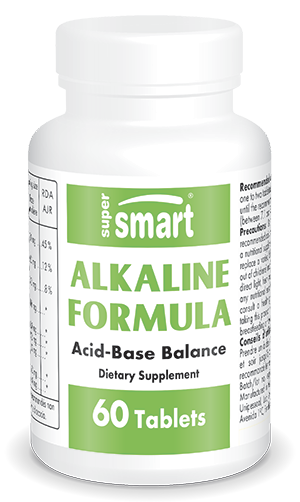 Take one to two tablets, morning and evening, until the recommended pH is achieved (between 7.1 and 7.5).